"Now remember, Donna, you will have to decide on one of these men. It was your father's wish that you have some choice in the matter. I know that you'll make the right one." Whew, what a year it has been for combination classic comedy aficionados and DVD collectors (and their credit cards). Universal has given us three sets of Abbott and Costello classics, Warner (by way of MGM & RKO) digitally upgraded their Marx Brothers titles as well as another wonderful collection of Chaplin masterworks, and, just in time for holiday season 2004, here comes multi-disc sets saluting W.C. Fields and yet another box of Marx madness chronicling their practically flawless output for Paramount, arriving courtesy of Universal (ownership has its privileges). But the studio with those snow-capped mountains in their logo have a back-catalog goldmine of their own to shout and shimmy about, thanks to a 10-disc onslaught of Jerry Lewis gems, an event to me that's the yuks 'n' guffaws equivalent of The Beatles catalog landing on CD back in 1987. Without being too mawkish, having the likes of the clown prince of comedy and many of his inspirations back again (and for keeps, to boot) is like revisiting moments from my childhood: excitedly awaiting a non-school night late, late movie TV showing of Jumping Jacks, getting weekend homework assignments done pronto so I could catch the Saturday afternoon presentation of Rock-a-Bye Baby and convincing my parents I would rise and shine without complaint if they'd let me stay up past my bedtime on a Sunday eve to enjoy The Patsy. The Family Jewels is another one of those JL films I recall looking forward to whenever it turned up in the TV listings. Though the memory of how it played to me decades ago is far better than watching it again through the eyes of adulthood, it still provides a hefty quota of laughs, some truly inspired funny moments, and a lot of heart at its core. Lewis takes to the wheel as devoted chauffeur/bodyguard Willard Woodward, an occasionally klutzy yet adorable guy who lives for looking after 9-year-old Donna Peyton (Donna Butterworth), daughter of a recently deceased millionaire who's been left a big chunk of change. At the request of her family attorneys (Jay Adler and Neil Hamilton, Commissioner Gordon from TV's Batman), the little tyke must pay a visit to each of her uncles, all vying for the chance to inherit the role of Papa. Will it be aging sea captain Uncle James (Lewis)? Perhaps the burned out clown Uncle Everett (Lewis!)? Possibly photographer Uncle Julius (laaaaydddeeee! It's that Jerry Lewis guy again!) could wind up in the finished picture. Or the chipper, upbeat pseudo-British charmer, Captain Eddie (Lewis yet again). But maybe all bets should be on Uncle Skylock (guess who), a private detective, who could could get to the bottom of this mysterious stranger hurling deadly weapons in Willard's vicinity as he transports this poor little rich girl from prospective daddy to daddy. Hearkening back to the warm, fuzzy approach of early Lewis films like Rock-a-Bye Baby and The Geisha Boy but fused with the comic's more polished finesse attained in succeeding years, The Family Jewels is a slightly more sedate but no less silly-a-thon with the added bonus of Jerry doing Peter Sellers a few better in the multiplicity department (and just about on equal footing with the late, great Tony Randall's work in The Seven Faces of Dr. Lao). However, the first third of the picture is a bit inconsistent; the Uncle James flashback is like a so-so Saturday Night Live skit that never gets off the ground, although I liked the dark and brooding approach Lewis gave to the brat-despising circus performer, but it's a little too downbeat for a family film. However, at around the 45-minute mark when Uncle Julius comes aboard, Jewels finds its way for keeps, followed by one of the best extended set pieces ever to grace a Lewis effort, courtesy of Eddie Peyton, a relentlessly upbeat English-accented pilot and owner of a single-unit airline (which looks badly in need of some serious upgrading as judging by a rather discrepancy-filled flight with charming, but mostly clueless little ol' ladies aboard. On a par with Nutty Professor's Kelp, Eddie is one of Lewis' most endearing creations to such a point, I'm surprised he didn't become the basis for a feature film of his own or at least a cartoon spinoff. Though primarily a showcase for the comedian's way with accents and character skills, a couple of supporting roles are worth noting: Robert Strauss, whose gruff comical disposition made him in high demand for such roles throughout his career (particularly as the no-nonsense sergeant in the Martin-Lewis classic, Jumping Jacks, which MUST be on DVD before my lifetime expires, Paramount! ), and, of course, engaging Hawaiian child actress Donna Butterworth, who effortlessly captures our sympathy and support as orphan Donna, without resorting to cloying kid thespian tricks; in other words, she's a natural. On a side note, it's puzzling why Butterworth's cinematic career only lasted for two films, the second being an engagement with Tupelo, Mississippi's eternal pride and joy, Paradise Hawaiian Style. To have performed alongside the clown prince and the king of rock and roll back to back? Talk about memories. Sadly, with the exception of a completely sedate role in Tony Curtis' Boeing, Boeing, Family Jewels would be Lewis' last traditional comedy film for Paramount. Due to creative differences and such, a legendary 15-year relationship that was mutually beneficial (not to mention that of a certain beloved song stylist and underrated actor in his own right) came to an end by 1965's close. Rather than end on a downer, here's a viewing tip that will keep you busy and rewarded while watching. Rather than give in to my usual impulse of noting great cameo bits, I've purposely left off two great surprise appearances that are gems. Layddeeeee! Image Transfer Review: Pretty much keeps in line with most of the other first cycle JL releases; nice, clean print, practically no edge enhancement or artifacts in sight, gorgeous and consistent color (if not as omnipresent as the more stellar and better known titles). Not a total jewel, but more like a sparkling gem. Audio Transfer Review: Considering the time in which it was conceived, this is a pretty standard but gets-the-job-done monophonic soundtrack. Not devoid of occasional but typical age related shortcomings (occasional distortion of the score, etc.) it's dandy enough. Extras Review: Though not as chock full as other recent JL discs, there's a fair amount of mildly interesting vault offerings (gathered in the Archival Materials section) including Donna Butterworth's screen test, which shows Jerry's great way with kids as he dispenses with the usual line-reading mumbo jumbo to engage in silly banter with his eventual co-star to loosen her up; another so-called screen test is more like a wardrobe/costume check for a gangster-ish character that emerges in the final third of the story. Two brief bloopers are more useful in giving us a look at Lewis the director and pale in comparison to much more rib-tickling gag reel fare found on other JL offerings. Concluding the bonuses is another commentary track pairing Jerry with good pal Steve Lawrence. After the high of the stellar-talkathon for Nutty Professor, this was the equivalent of a morning after with Buddy Love (well, maybe not that bad). Mostly a "let's watch the movie and guffaw" experience, useful nuggets are about as hard to come by as a needle in a haystack; although Lawrence is heck of a nice guy, I think future sitdowns with Jerry need to incorporate a third party familiar with his techniques and well versed in the comedian's filmographies (The Films of Jerry Lewis author James Neibaur and longtime friend Peter Bogdonovich come to mind...or hey, me!) Still amidst lots of silent gaps, a few fascinating factoids wash to the surface like the aid of a legendary pool hustler who trained Lewis in fine art of trick shooting for a climatic scene, having to extend the Eddie Peyton shooting schedule by a day because the comedian just couldn't keep a straight face for long, the difficulty of playing Everett (the clown) as a total meanie and getting knocked down by a fire engine (which when done successfully, set up one of the funniest sight gags in the movie). 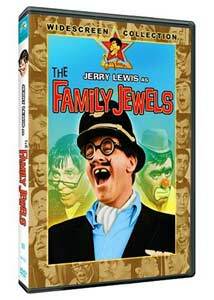 Following the quasi-experimental tone of The Patsy and the over-the-top (for some at least) shenanigans of The Disorderly Orderly, The Family Jewels marked a mostly consistent return to accessibility for Jerry Lewis. Recommended for both the comedian's ardent fans and families looking for an appealing blast from the past.